A vacation to Thimphu is a cherished journey for relaxation. The mystic Himalayas, the colorful rivers, the blossoms of fragrant flowers and the sacred monasteries, Thimphu is aptly the capital of the ‘Happy Nation,’ Bhutan. Thimphu is an ancient seat of Buddhism and hence the meticulous monasteries of the country take you back in history. The 13th century monastery of Changangkha Lhakhang is not only a spiritual home where children are named but also offers a panoramic view of the Thimphu Valley. You can also checkout the unique incarnation of Lord Buddha here as Avaloketesvara Buddha of compassion; the statue is made of bronze and gold and comes with eleven heads, thousand hands and eyes. Buddha Point, the heart of Bhutan holds the largest statue of Buddha at Bhutan; with 51.5 meters of height and filled with 125000 smaller statues; this bronze deity is both a piece of amazement and homage. Dechen Phodrang, the school of monks is the best place to witness the life of dedication and divinity of the Buddhist priests. With numerous 12th century paintings and the large statue of Zhabdrung Ngawang Namgyal, this dzong is no less than a treasury. Thimphu, perched at the Eastern Himalayas is the best place to dive deep into the Himalayan history. Be at the national library of Thimphu to turn the pages of Himalayan art and culture, to read about Buddhism from the real, golden pages of hundreds of years old manuscripts and books. If painting fascinates you, be at the Zorig Chusum, the school where students are taught about thirteen traditional art and crafts of Bhutan. The National Memorial Chorten, the monument dedicated to global peace and prosperity depicts some of the gems of Buddhist philosophy in form of paintings and idols. Roll the giant, bright-colored prayer wheels of the chorten to pay homage to Lord Buddha, as the Buddhist chants and the aroma of incense fills the air. Bhutan is famous for its varied stamps; round, square, rectangular, triangular and 3 dimensional can be your best souvenirs. The 350 years old monastery-fortress, Tashicho Dzong is also a must visit to witness the blend of history and modernity, as at present it serves the administrative office of the king. The traffic police of Thimphu is another amazement; there are no traffic lights at Thimphu and the complete traffic of the city is controlled manually by the police, who wearing while hand gloves skilfully manages the transportation. Bhutan is a carbon negative country with 72% virgin forests; hence it is certain that Thimphu offers you an ecstatic view of nature. Hike or cycle through the pine fringed roads to feel close to nature. As the dawn breaks at the city, the hills and forests of Thimphu become melodious with the tweets of birds. Be at Takin Preserve to meet the national animal of Bhutan, the strange-looking takin. Rest your tired feet at the coronation park or witness the biodiversity of Bhutan at the botanical garden. Archery and khuru are the traditional sports of Bhutan; soksom, pundo and digor are some other adrenaline boosting sports that you can enjoy here. Witness the grand Buddhist festival of Tshechu at Thimphu. The mask dance based on the stories of Guru Padmasambhava unfolds the cultural richness of Bhutan. Monks and locals, all assemble to celebrate the victory of good over evil. If you love colors you cannot return from Thimphu without bringing back the traditional, patterned kira dresses. Lungta handicraft defines Bhutan. There are several handicraft emporiums at Thimphu from where you can collect this handicraft which comes in the form of Himalayan jewelries, antique boxes, arts and crafts. 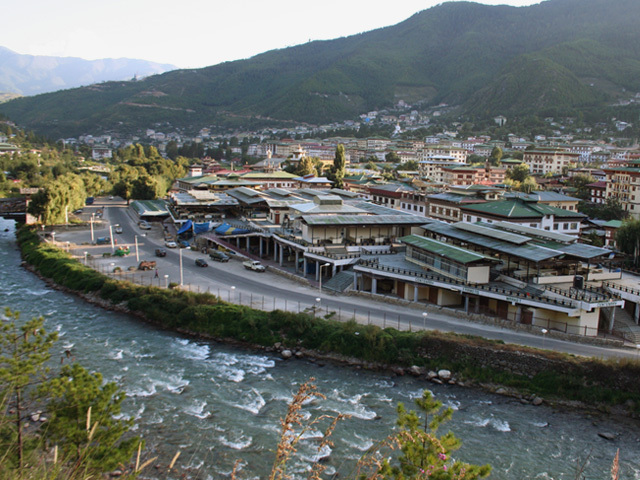 Thimphu is an abode for art lovers and you have lots of ceramics, paintings and street arts to pack your bags with. Last but not the least; feel comfortable wearing the soft and warm Bhutanese sweaters, which are famous worldwide. Cheese and chili, just by these two words you can define Bhutanese cuisine. Thimphu, the capital city has various Chinese restaurants, but if you want to get the real taste to Bhutan, you must try out the national dish of ema dashti. Relish mushroom dashti, dried beef, steaming hot red rice, fried rice, buckwheat pancakes, lots of pickles and chillies in wooden bowls with wooden ladles to enjoy the pleasant, chilly weather of Thimphu. Hence, a tour to Thimphu is an escapade far from the maddening crowds, rejuvenating natural bliss.